I spent three days this week working in el Campo, 90 miles southwest of Houston. 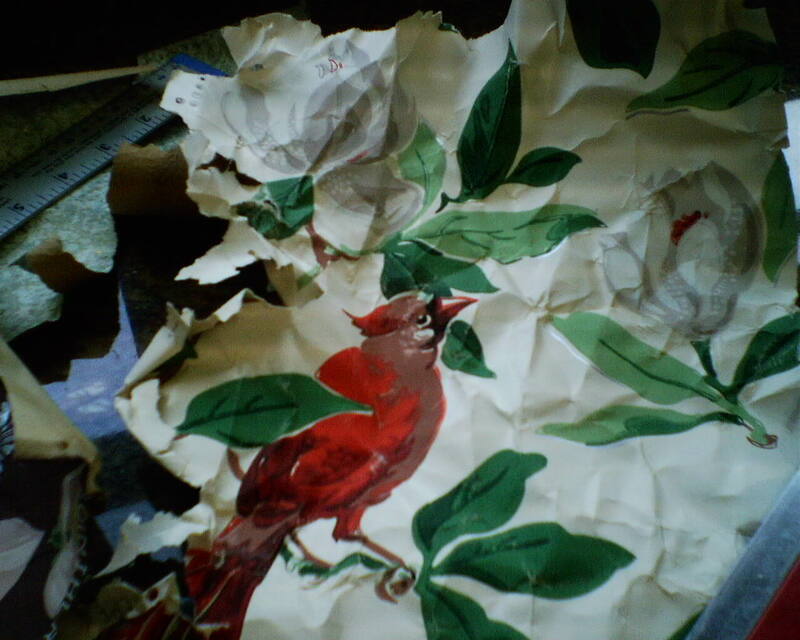 The painter on site has a 1903 farmhouse, and in the attic he found these wallpaper scraps. 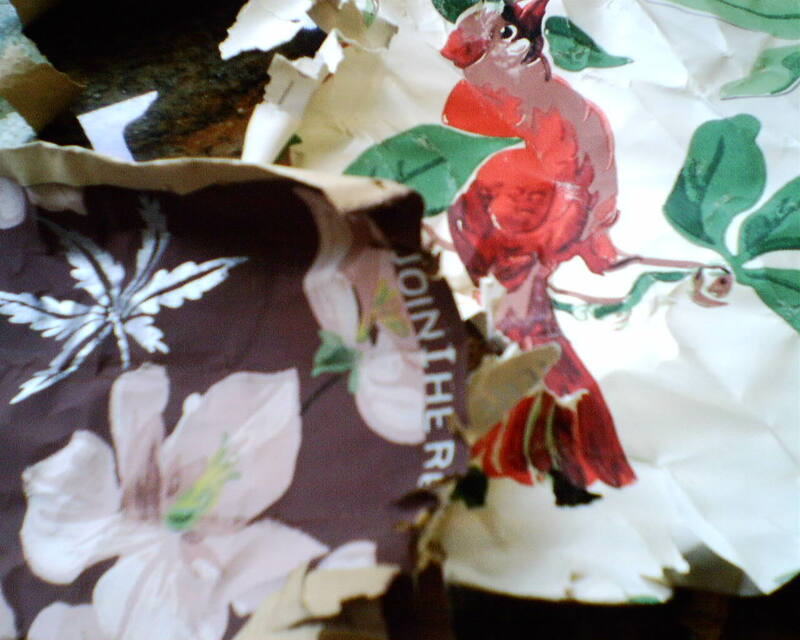 He was tickled that I loved the paper as much as he does, so he insisted that I take some pieces for my collection. 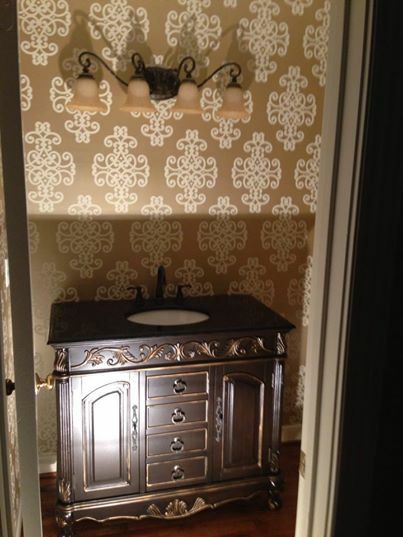 Here’s another shot of a damask / medallion hybrid wallpaper I hung in April 2014 in a Clear Lake powder room. They will add a mirror soon. Mirrors (and vanities, and cabinets, and bathtubs, and lots of other things) are big and heavy and unwieldy, and even big burly guys can have trouble maneuvering them into place without hitting walls or woodwork or BRAND NEW WALLPAPER. 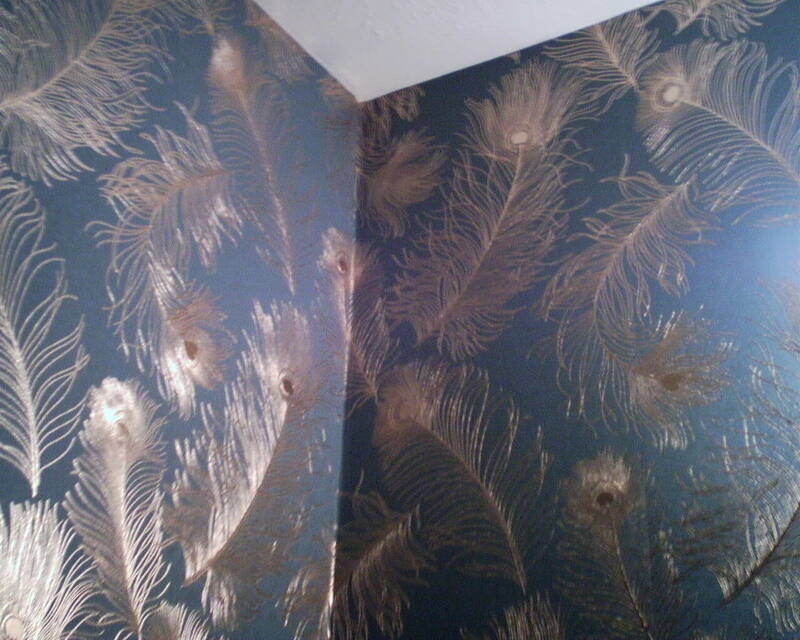 This richly-colored wallpaper with a gold metallic peacock feather motif went in an upstairs hall bathroom in a townhouse in Montrose. It is by York Wallcoverings, #ET 2017. Usually I don’t like paper-backed vinyl material (mainly because of curling and peeling under humid conditions (bathrooms), but this one was lovely to handle, with seams that laid nice and flat; I expect it to perform well over the years to come. Some companies that make similar papers embellish the design with rhinestones or other “gems” planted in the “eye” of the feather. I mentioned that to the homeowner and, well, maybe, just maybe, she will get the bug to go to a craft store and buy some rhinestones and glue them on. 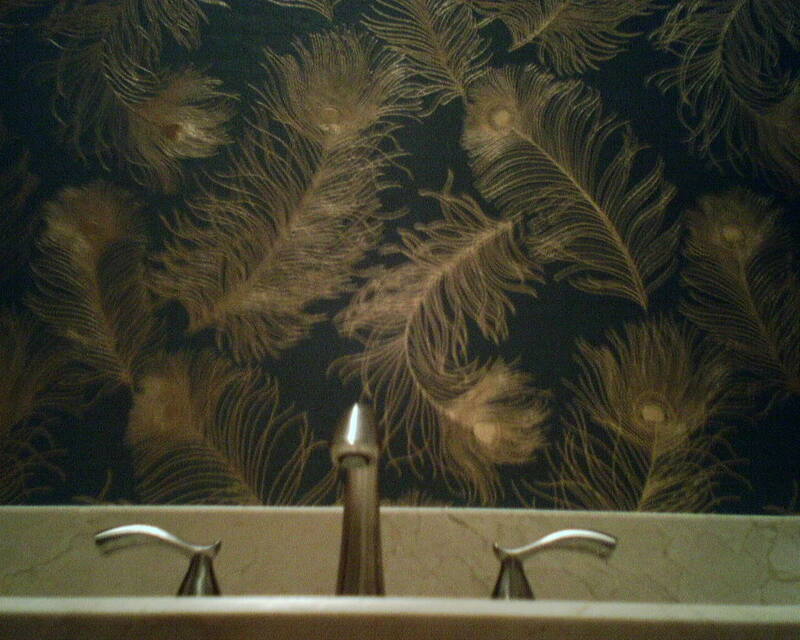 Either way, this paper really dressed up the bathroom! 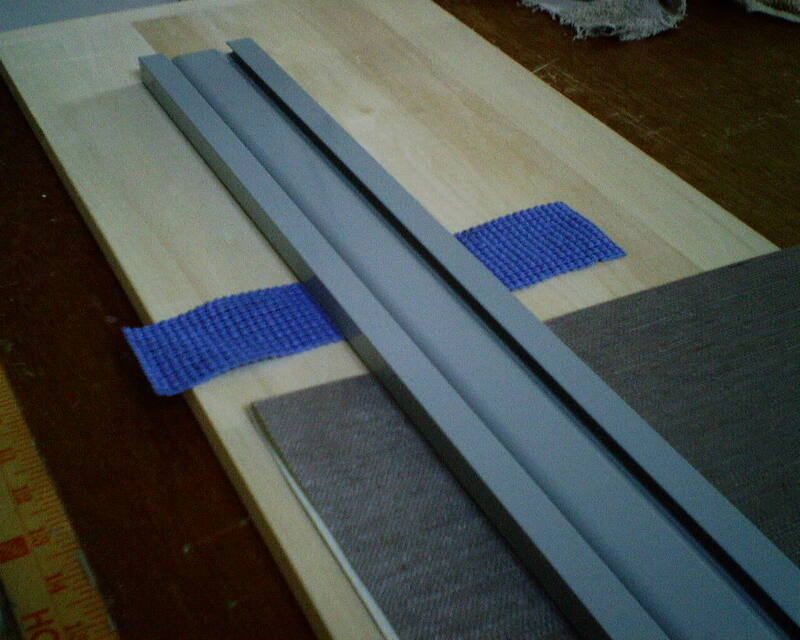 In the first photo, the grey metal (magnesium) bar is a fancy straightedge used to hand-trim certain papers. If it slips, you don’t get a straight cut. 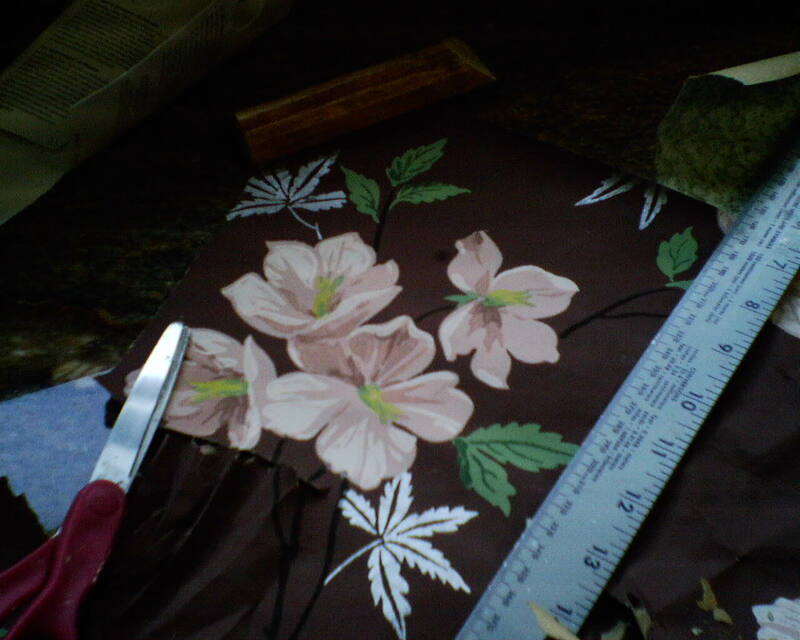 These strips of shelf liner have plenty of grip, and grab tightly to both the straightedge and the wooden table. In the second photo, the ceilings are so high that I cannot the top of the wall over the sink, so I am using a bucket to extend my reach. (Normally, I use a plastic step stool, but this vanity top was too small for it to fit.) Here I am using a larger piece of shelf liner under the bucket, to both protect the client’s countertop and keep the plastic bucket from sliding around on the slick granite. See the faint black lines on three sides of this electrical box? 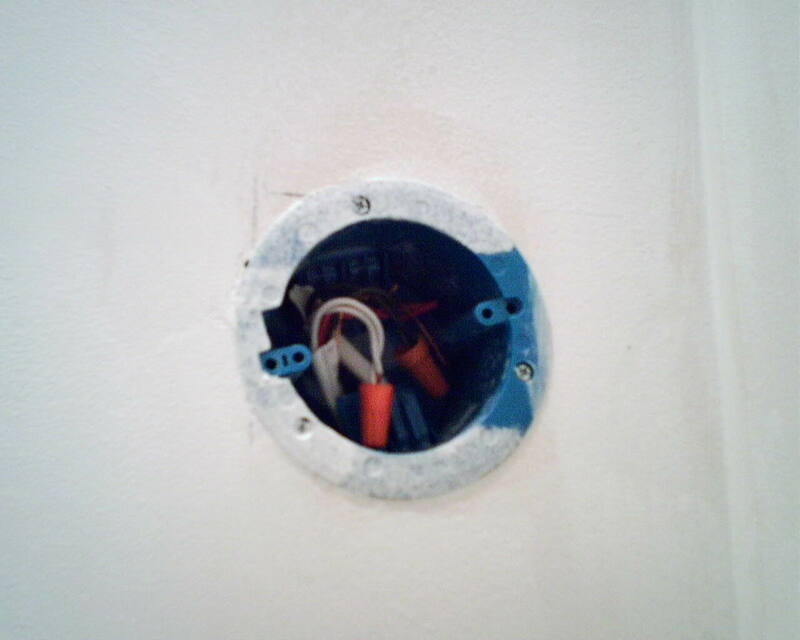 When the electrician marked where the box would be situated on the wall, he used an ink pen. This is a no-no! Most workmen carry pencils, because they know that ink will bleed through paint and wallpaper. 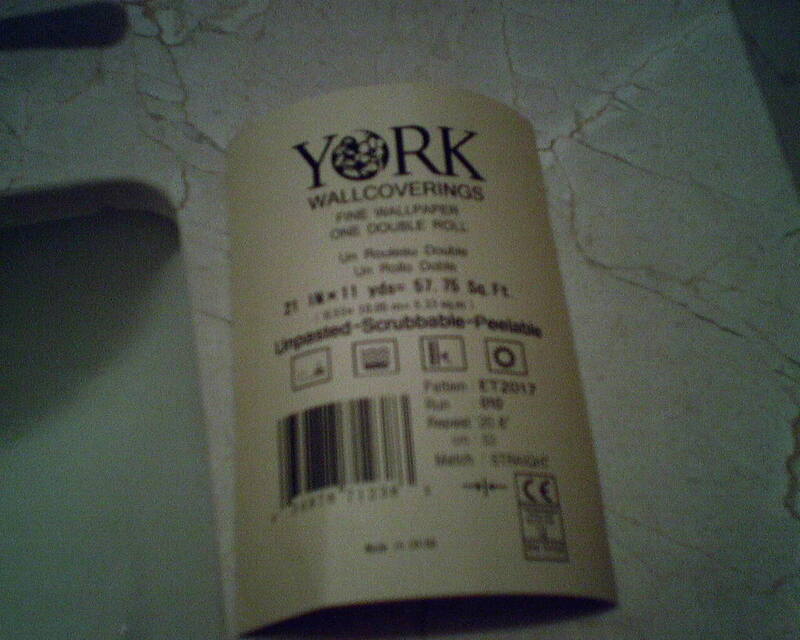 In the photo, the marks are covered by my wallpaper primer. But just to be safe, I went to my van and got some KILZ, a super product, that seals all kinds of stains and stuff (water, ink, blood, rust, mildew, smoke), and daubed some on top of those black ink marks. A funny anecdote, if you have a minute … I have friends in Phoenix who rented an apartment. They swore that someone must have met a tragic end in the unit directly overhead. Because there was a stain on the ceiling that they insisted had to be blood. And to add to the mystery, the stain kept coming back, in the same size and outline, no matter how many times they painted the ceiling. Silly people, I thought. Just KILZ it and be done with it. It’s not a blood stain; it’s water, like from a bathtub that someone let overflow. KILZ will seal it once and for all, and you’re back to a nice, unblemished ceiling. They never did. I think they preferred to live with the mystery and history. 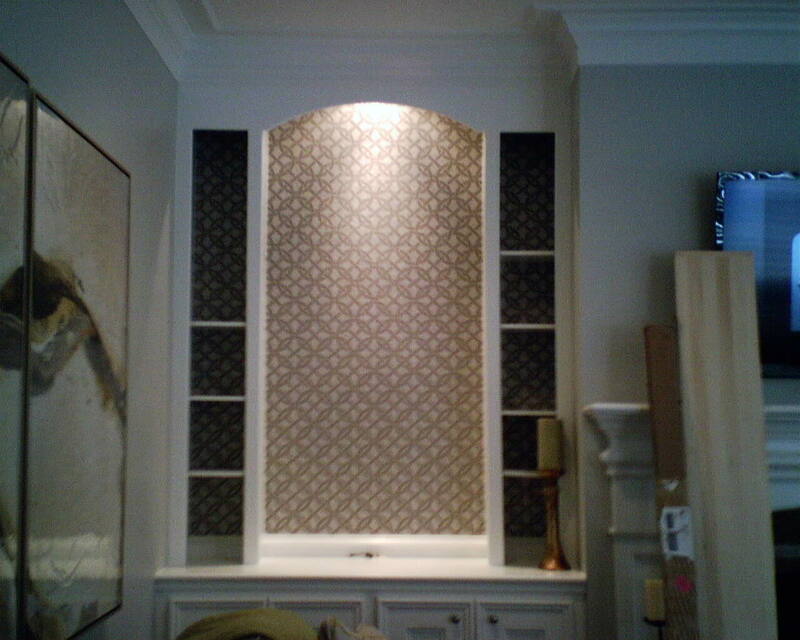 This interior designer usually puts grasscloth on the backs of bookcases. This home has a more contemporary vibe, though, so they went with a textured, patterned, grey-on-silver design. Let me tall ya – grasscloth is pretty much put-up-a-strip-and-done. This geometric pattern, though, took a lot more math and engineering, to get the circles centered in the bookcases, as well as in the narrow shelves on either side, and keep everything lined up. I must have spent 3-4 hours on these two sets of bookcases. It’s interesting that, when I got to the two flanking narrow shelf areas, because I wanted to keep a circle centered in the cavities, instead of perfectly matching the pattern to what was in the larger niche, if I kept the diagonal elements lined up with those in the larger shelf, the circles dropped down a little. I chose to keep the diagonal lines lined up, rather than keeping the circles all at the same level, because I felt the diagonals were a stronger visual element. Besides, the shelves will be filled with stuff anyway, and you won’t see much of the wallpaper or the dropped down circles. The white wooden shelves will be replaced with glass, BTW. Yeah, that’s a little technical, but let’s just say that my goal was to give the most pleasing view-from-a-distance. The designer is Pamela O’Brien of Pamela Hope Designs. http://www.pamelahopedesigns.com/ I love working with this gal, and I find her interiors to be sophisticated and chic, yet easy for the “average” family or couple to live with – nothing overly fussy, and rooms you can actually use, instead of showcases. City living has lots of benefits, but not always a lot of green space. 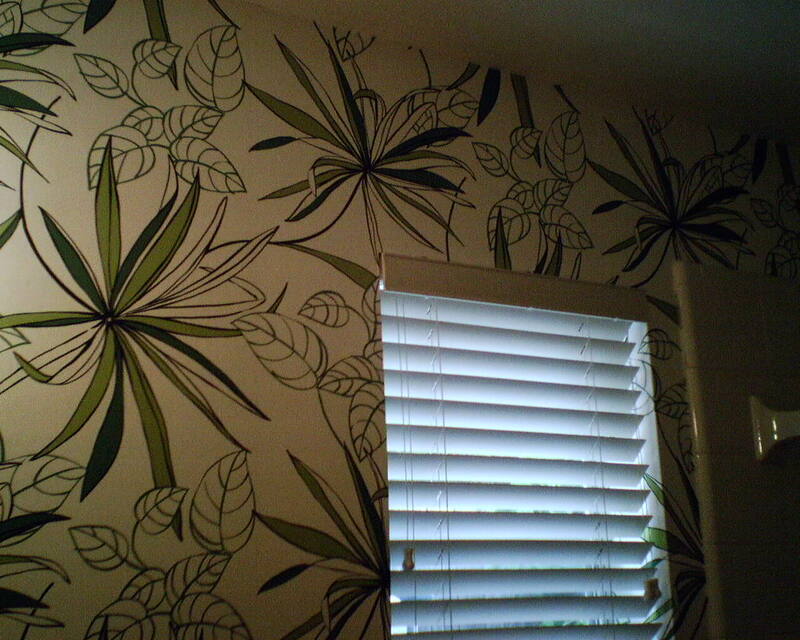 So why not bring the outdoors in, and add a little green leafy vegetation to your home? 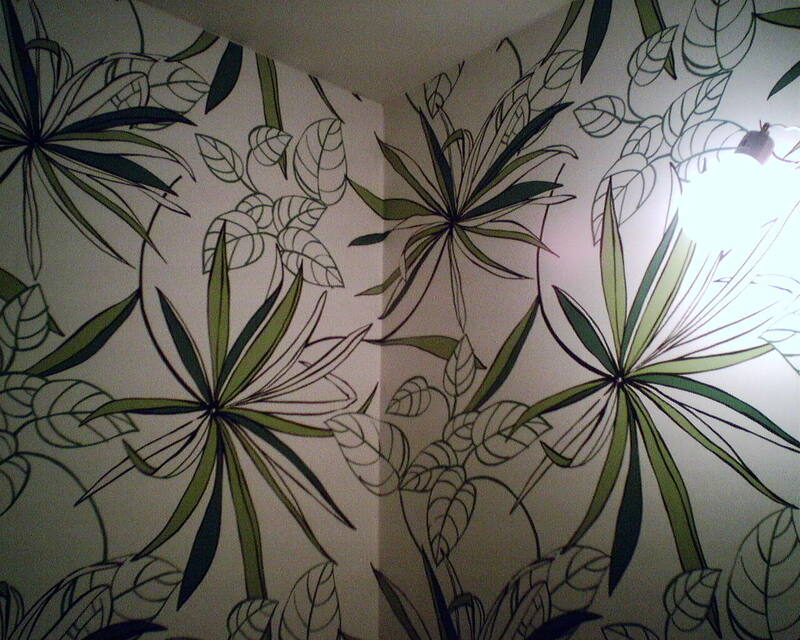 This wallpaper is by Designer Wallpapers, and was hung in a downstairs bathroom in a townhouse in Montrose. I rarely get to see rooms once they’re finished and put back together. 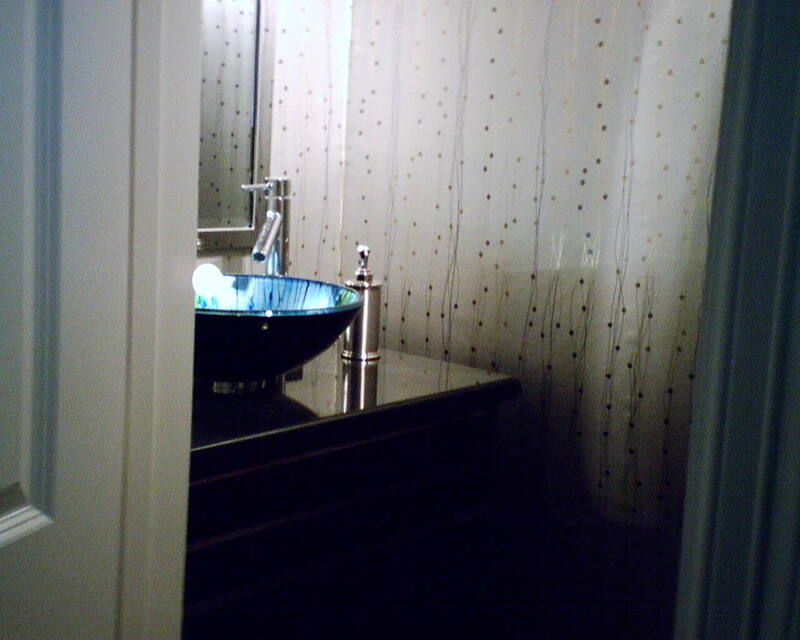 But today I went back to wallpaper two more bathrooms in a home where I’d papered the powder room last month. In the meantime, the counter top, vessel sink, and faucet had been installed. All complete, it looks great! Here you see a seam that is not lying flat. 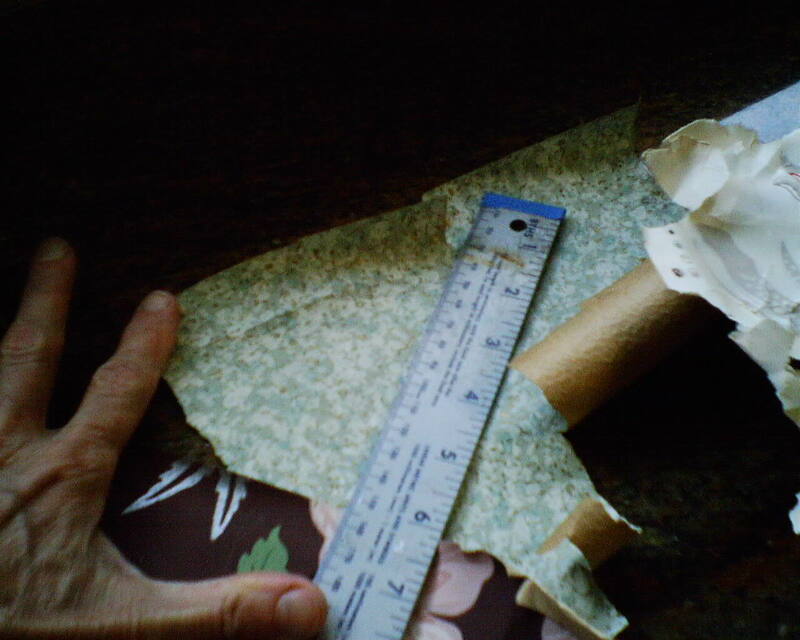 As the paper dried, it pulled taught, and, because the surface below was unstable, the wallpaper pulled some of the paint away from the Sheetrock. 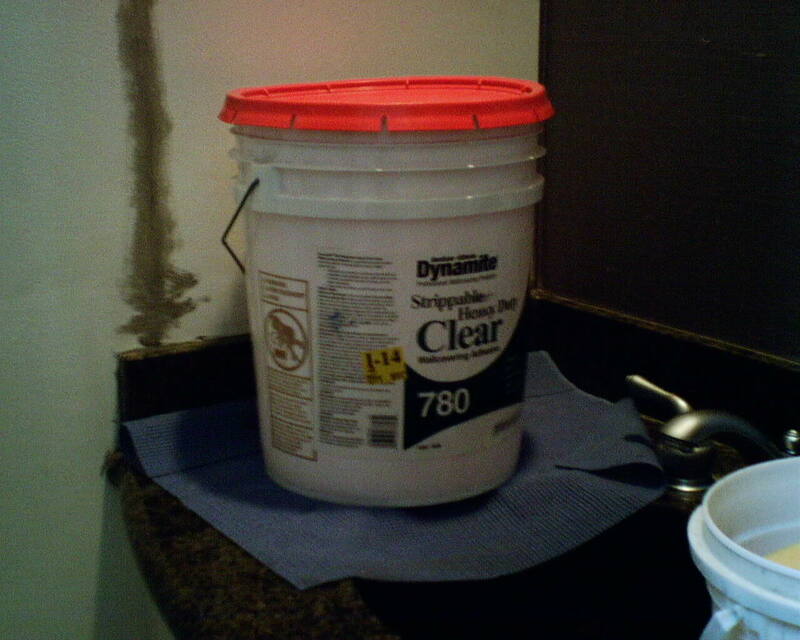 In addition, there were 1″ x 3″ bubbles underneath, not the wallpaper bubbling, but the paint underneath expanding and releasing from the Sheetrock. All of the other walls in this two-room bathroom were fine. 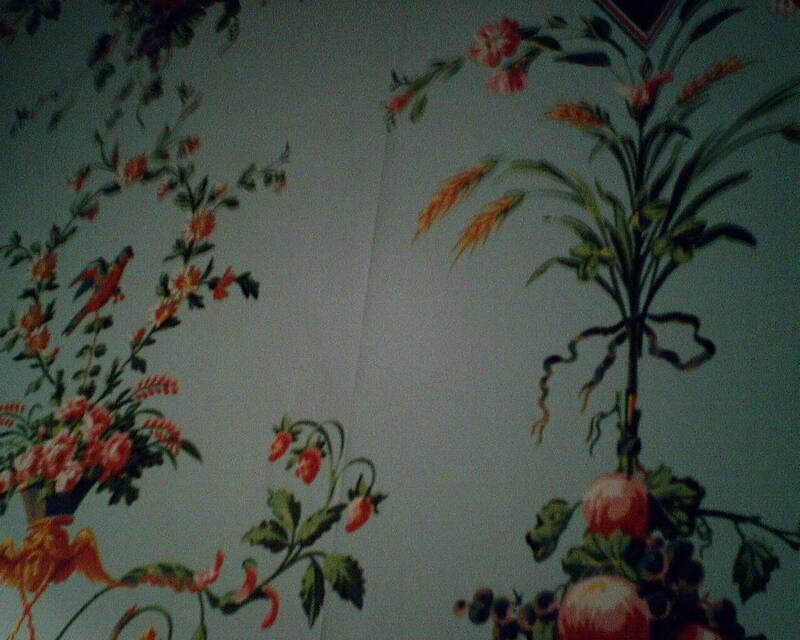 As it turned out, when there was wallpaper on this wall previously, there was a seam that did this exact same thing. During renovation earlier this year, it was discovered that a pipe inside the wall had a leak. 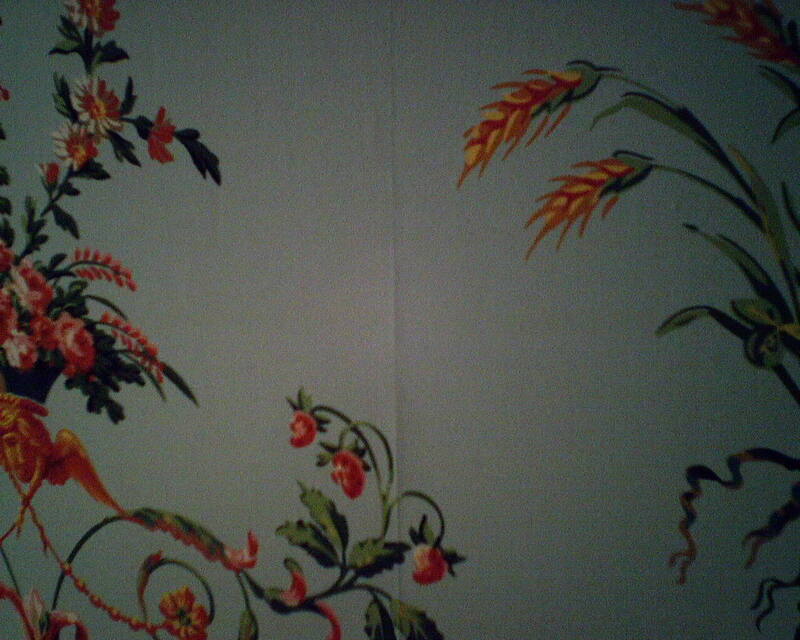 That, or possibly a leak in the roof, most likely have much to do with the wallpaper problem. What’s hard to understand, though, is why this happened again, after the leaky pipe has been fixed. It leads one to think that the problem is in the Sheetrock. But, once Sheetrock is dry, it’s dry, right? So it’s hard to understand why the paint would delaminate from the wall. This is an unfortunate mess, and the homeowner now is left with trying to figure out what the problem is, and what the solution is. I am hoping they re-Sheetrock the wall, either with 1/4″ drywall over the existing wall, or, probably better (but more mess and more expense) ripping out the old Sheetrock, checking the insides of the wall for continuing leaks, and then replacing the Sheetrock with brand new. You are currently browsing the Wallpaperlady's Blog blog archives for May, 2014.